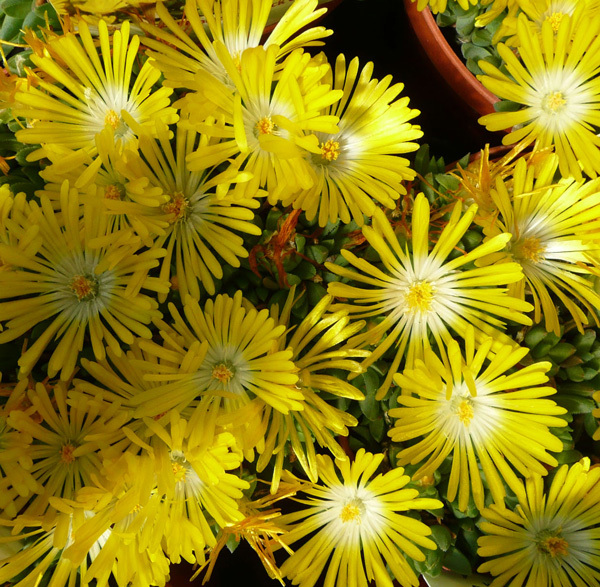 This hardy Ice Plant is native to South Africa but are amazingly hardy in North America, provided they are grown in very well-drained soil. This species forms a low mat of succulent, evergreen leaves, bearing loads of small starry yellow flowers in late spring. A great choice for hot, dry areas. Excellent as a groundcover, in the rock garden or wall, for edging, and especially as a lawn substitute. Attractive to butterflies. Easily propagated by breaking off short pieces and simply sticking them into the ground; new roots will form within just a few weeks. Foliage turns bronze in winter.